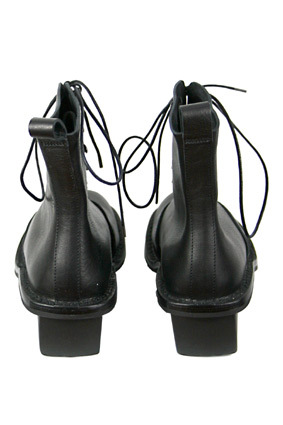 Trippen 'Lady' boots in black, textured leather (black-waw). High heeled, 4 sectioned soles. Lace up with lower three lace loops through holes and the upper 5 lace loops on metal hook-ups. Beautiful boots. Sizes 4=37 small, 5=38 medium, 6=39 large, 7=40 x-large.